Conference participants may need a Chinese visa to enter mainland China. Specifically, those who are not Chinese citizens, except passport holders from Singapore, Brunei, and Japan, need a Chinese visa. Participants can apply for a visa at the Chinese embassy or consulate in the region in which they live. To avoid uncertainty, participants are advised to apply for a visa as early as possible. It is recommended that they apply for a Chinese visa at least 1 month in advance. For most attendees, it is easier to apply for a Tourist ("L") visa; an invitation letter is NOT required for obtaining a Tourist visa. To apply for Tourist visa, you may need to submit flight ticket reservation sheet and hotel reservation sheet. If you reserve the hotel of the Ming Wah International Convention Centre (the venue of ICFHR 2016), the organizing committee will provide reservation sheet. Reservation for other hotels can be processed on the Web. If some participants need another type of visa that does require an invitation letter, the ICFHR 2016 local arrangements committee will help to apply for official invitation letter. To obtain an invitation letter, please send e-mail to icfhr2016@nlpr.ia.ac.cn, with the scanned copy of your passport (the page with photo, full name, birthday and validity), and in the case of being an author, your accepted paper ID. It takes about two weeks to get official invitation letter. Visiting the official website of the Embassy of the People’s Republic of China in your country, the website provide enough information for the VISA, including the Introduction to Chinese Visa, How to Apply, Fees, Processing Time, and so on. You only need to follow the steps introduced by the website to apply the VISA. If you are entering Shenzhen from Hong Kong, you can apply for single entry five-day visa on arrival (VOA) at Luohu (Lo Wu) Port, Huanggang Port, Shekou Port and Fuyong Port. With this visa, you can visit Shenzhen only and stay for 5 days (counted from the next day of entry) at most. 4. pay for the VOA (in Chinese RMB). Passport holders of most countries can easily get a VOA in Shenzhen, such as Australia, Canada, New Zealand, UK, Ireland and Spain. Some may apply for it showing passports with proof that they have been issued Chinese visa before by embassies and consulates, such as Indonesians and Philippines. However, US passport holders are not eligible for Shenzhen Five-Day VOA. Other countries not eligible are passport holders of India, Afghanistan, Algeria, Bahrain, Cameroon, Egypt, Iran, Iraq, Jordan, Kuwait, Israel, Lebanon, Liberia, Libya, Nigeria, Oman, Pakistan, Palestine, Qatar, Saudi Arabia, Somalia, Sri Lanka, Syria, Sudan, Turkey, Uganda, United Arab Emirates and Yemen. Currently, the fee for most nationals is 168 RMB (Chinese Yuan). The different fees are set on a reciprocal basis. For UK citizens, it is more expensive. Only RMB is accepted for payment. Money exchange or ATM is available at the port. Conference Venue: The Ming Wah International Convention Centre, a four-star comprehensive deluxe hotel located in the heart of Shekou (a part of Shenzhen City), and is only 5-10min walk to the Shekou Ferry Terminal. The nearest subway station is Sea World, which is one stop from the Shekou Ferry Terminal. Airport 1 at Shenzhen: Shenzhen Bao’an International Airport is located near Huangtian and Fuyong villages in Bao’an District, Shenzhen, Guangdong, China, 32 kilometers northwest of the city center. Visiting the website of the airport: http://eng.szairport.com/, click “Traffic”, you will see the traffic guideline from the airport to the downtown of Shenzhen, Hong Kong and Macau, etc. Besides, there are many other useful information on this website. Airport 2 at Hong Kong: Hong Kong International Airport is located on the island of Chek Lap Kok, which is largely composed land reclaimed for the construction of the airport. The airport is also colloquially known as Chek Lap Kok Airport. Visiting the website of the airport: http://www.hongkongairport.com/eng/, click the ‘PASSENGER GUIDE’, you can see the Transfer/Transit information, and click the ‘TRANSPORT’, you can see the information of To & From the Airport, Transport Connection with Mainland China (including Shenzhen), and so on. Besides, there are many other useful information on this website. Airport 3 at Macau: Macau International Airport is an international airport in the special administrative region of Macau, situated at the eastern end of Taipa island and neighbouring waters. The website of the airport is: http://www.macau-airport.com/en , click the ‘PASSENGER GUIDE’, you can see the Transfer/Transit information, and click the ‘TRANSPORTATION’, you can see the all traffic information to & from the airport. Besides, there are many other useful information on this website. From Airport 1 to conference venue: Take taxi: it costs about RMB 70-80, and about 50 minutes. Take subway: Airport station -> take subway line 11 -> Houhai station, transfer for line 2 -> Sea World station, get off, leave the station by exit D -> walk to the conference venue. It takes about 70 minutes totally. From Airport 2 to conference venue: Take boat from the SkyPier (near the Hong Kong international airport) to Shekou Ferry Terminal (Shenzhen), the time table about the boat is listed below, the price is about RMB 200-300. Shekou Ferry Terminal is near to the conference venue (about 1.5 kilometers), you can choose taxi/bus/subway/walk to the conference venue. Taxi: about 10 minutes, costs RMB 12. Subway: Shekou Port, take subway line 2 -> Sea World, get off, leave the station by exit D -> walk to the conference venue. It takes about 20 minutes totally. 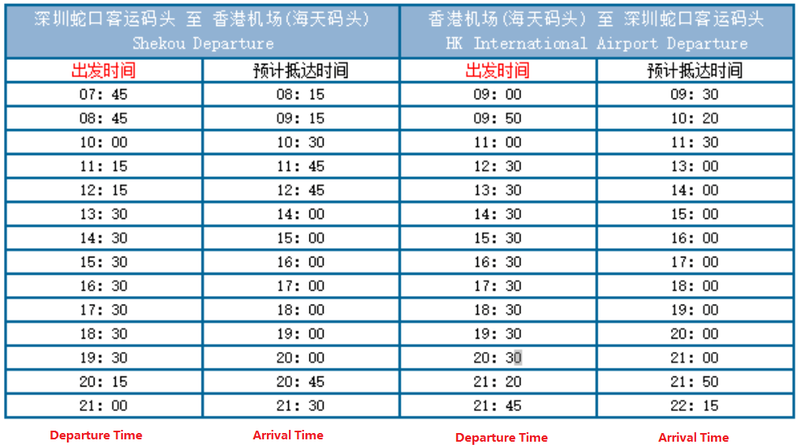 From Airport 3 to conference venue: Take boat from the Macau Taipa Ferry Terminal to Shekou Ferry Terminal (Shenzhen), the time table about the boat is listed below, the price is about RMB 200-300 yuan. 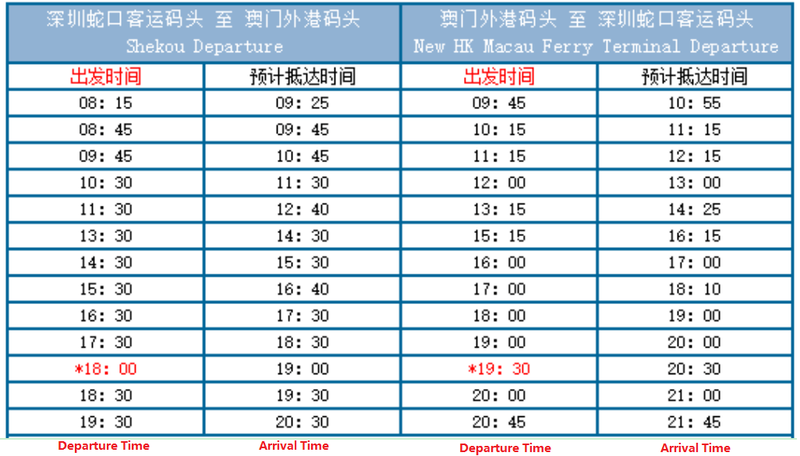 Alternatively, take boat from the Macau Outer Harbour Ferry Terminal to Shekou Ferry Terminal (Shenzhen), the time table about the boat is listed below, the price is about RMB 200-300. The Macau Taipa Ferry Terminal is near to the Macau International airport, however, the Macau Outer Harbour Ferry Terminal is a little far, you can go there by taxi from the airport. Note: (1) the route lines provided above are just for reference, you may find other suitable lines by yourself. The Baidu Map and Google Map are powerful tools. (2) Sometimes the boat tickets are not enough (sold out very quickly), especially on the weekends, so, buy the boat tickets ahead of time is a wise choice.